For stellar examples, you need look no further than Brooklyn, the land of arts and crafts. Niche perfumery partakes of both. On the one hand, blending perfumes requires a practical set of skills; on the other, niche perfumers have a very precise artistic vision for each fragrance they conceptualize. They’re no strangers to other art forms: notable Brooklyn-based olfactory artists come from the realms of music, animation, fine arts and haute cuisine. 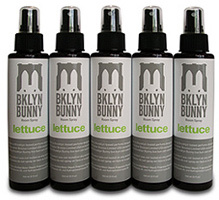 — From In the Niche Fragrance Market, Brooklyn Has Scents of Its Own at The Bridge. The Williamsburg neighborhood of Brooklyn is known as an epicenter of street fashion and new indie music. However, its atmosphere of somewhat judgmental coolness can wear thin after a while. Fortunately, the “unisex apothecary” called Miomia is located a few blocks away from the relentlessly hip fashion parade of the downtown area, on a quieter block with its own charms. 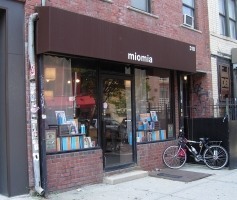 Miomia is a sunny storefront with white shelving and blond-wood floors, the kind of shop where you’re greeted by a friendly dog. While you peruse the shelves, you’ll notice a steady stream of neighbors and regular customers stopping by to re-stock their favorite products, purchase a gift, or just say hello.